Amy O’Neill, Zoo Revolution and The Well Fed Wolf, 2017, 16 mm transfer to HD video, color, sound, 8 minutes 6 seconds. Amy O’Neill is a New York–based artist known for her works that sift through the ruins of Americana. Her latest exhibition, “Convex Cornea,” which she discusses here, features a new video installation, drawings, and the wall-based “Bean-Bag Flats” series. The show is on view at Kristina Kite Gallery in Los Angeles from June 3 through July 15, 2017. MY FATHER ONCE TOLD ME A STORY about a rumor that spread throughout his high school in western Pennsylvania. To commemorate the assassinated president, school officials had asked for the face of John F. Kennedy to be grafted onto the head of their mascot, the Indian Chief Monacatootha, which appeared on a giant mural adorning the school’s entrance. I was born and raised in that area, where things tend to get muddier than anywhere else in the US. It’s a place to which my work keeps returning. Zoo Revolution and the Well Fed Wolf is a 16-mm film retrofitted to play in my parents’ 1970s television console. 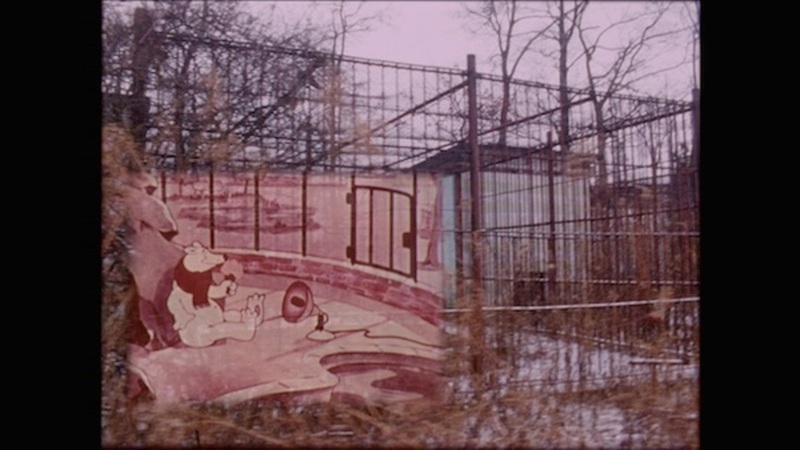 Over a death-metal soundtrack by the band Orphan, the film brings together an abandoned petting zoo and a storybook forest I visited as a child. Today the original snack bar, rusted cages, and the Old Woman Who Lived in a Shoe house are invaded by wild brambles and on the verge of disappearance. Footage from two children’s films—a cartoon and an educational PSA on good eating habits—have been injected throughout the piece. I can’t remember precisely when I first saw those shorts, but I like to imagine digesting them during my first grade class’s “slow” period, in a cool and darkened classroom after lunch. A lot of what I do takes many years to evolve. Deconstructing 13 Stripes and a Rectangle continues a work I began about a decade ago, around the time I first shot the petting zoo and the storybook forest. I asked a flag manufacturer to sew a batch of US flags minus the stars, and then I proceeded to hollow out the flag, excising the plain blue field and the stripes, leaving only the structural seams. This action was less about desecrating a flag than about physically opening up conversations about the continued casualties of war taking place worlds away, in Afghanistan and Iraq. An ongoing drawing series takes those stripped flags as subjects; for these I’ve applied a wax transfer technique to paper, which is a gentler approach for expressing my fears about the tattered condition of the United States political landscape. I draw like I think: piecemeal, over time. It’s kind of like surveying land, a job I assisted my father on—which I liked to think of as stories morphing into horizons, and then into lines. A similar process occurred for my “Bean-Bag Flats” series. For these, fabric panels from the much-coveted 1970s chairs have been deconstructed at their seams, flattened, and pinned to the wall. Their outlines resemble torsos—in the style of Weebles, egg-shaped toys from my youth. Screen-printed jelly bean patterns run throughout the fabric, which is also littered with T-shirt iron-ons of slogans such as SIT ON IT!, all from the ’70s and pressed onto the flats.